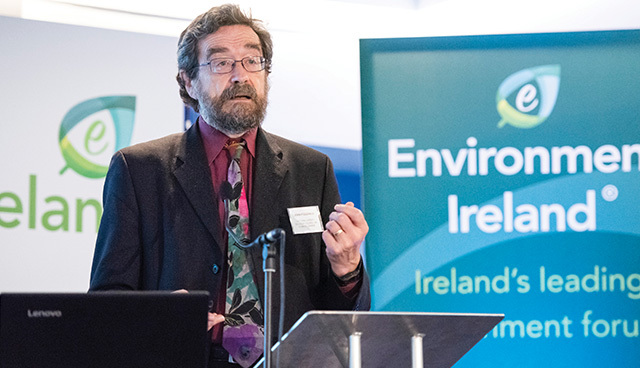 Chair of the Climate Change Advisory Council Professor John FitzGerald explores the need for a coherent strategy to meet Ireland’s climate change challenge and advocates for a carbon tax increase. John FitzGerald indicates that Ireland’s greenhouse gas emissions increased by 3.6 per cent (21.1 million tonnes of carbon dioxide) in 2016, returning to 2009 levels. “In 2011, emissions were at their lowest in the last decade and things have become steadily worse. It is a pretty depressing picture,” he explains. Indeed, the Environmental Protection Agency’s (EPA) research clearly indicates that Ireland is heading in the wrong direction based on current policies. “Our key message is that we are failing. We are not going to meet our 2020 target or our 2030 target. I have heard [former] Minister Denis Naughten using surprisingly strong language about our failure in this regard. This question is, as Laura Burke [Director General of the EPA] states, about introducing policies and the implementation of those policies,” the former ESRI research professor asserts. While setting targets is relatively simple, only through the implementation of new policy measures can change be borne out. While the Climate Change Advisory Council (CCAC) welcomes the National Planning Framework and the National Development Plan as providing a potential significant contribution to tackling climate change, FitzGerald maintains that robust implementation and monitoring are required. “In the long term, the NPF will be hugely important if implemented because a very dispersed population gives rise to unnecessary emissions. We need to change in this regard,” he explains. One of FitzGerald’s continuing frustrations is a perception that the Government has failed to establish a pathway of cost-effective measures to deliver decarbonisation. Many other countries, including the UK and Denmark have done so. “Since we were set up, we have asked the Department to spell out a pathway or pathways. These are measures that would deliver so many electric cars, the retrofitting of so many houses etcetera. It is then a question of a separate plan that actually makes that happen,” he outlines. The first step in guiding Ireland onto a sustainable path is setting an appropriate price for carbon. Currently, the carbon tax is €20 per tonne and it adds around €2 to a bag of coal and €0.45 to a bale of briquettes. Ahead of Budget 2019, the CCAC recommended that the carbon tax be raised to at least €30 per tonne with a commitment or a plan to raise it to at least €80 per tonne by 2030. “The world must change. If you want to change behaviour, you have to use the market to harness this change. A carbon tax is vital, firstly because higher prices mean that you tend to consume and emit less,” FitzGerald suggests. The revenue generated from the tax, can then be used dually by the Government to compensate vulnerable citizens who spend a higher share of their income on heating and electricity, as well as reducing other “damaging taxes”, thereby increasing GNP/GNI. “An ESRI study we published in 1992 suggested that around 30 per cent of the revenue generated should be used to that end and 20 years on, the ESRI have just published another study saying the same thing,” he indicates. Most importantly, it would send a message to investors, that if they invest in research and development of carbon free technologies, then they will make money. “It is only when the price is appropriate, and it becomes profitable for people to make the necessary investment that it will take place,” the CCAC Chair argues. Using the example of retrofitting households, the economist illustrates the necessity for increasing the price of carbon. Ireland has approximately 1.5 million occupied dwellings and virtually all would need to be retrofitted in order to eliminate carbon emissions from houses by 2050. “At somewhere between €25,000 and €50,000 per dwelling, we are talking about an investment of €50 billion – one quarter of the currently very high national debt. The State cannot finance that and at the moment, it is not profitable for people to do so,” he details. The EU Emissions Trading System (ETS) establishes the price of carbon for electricity generation, which the CCAC maintains it is currently “much too low”. As things stand, the ETS is not going to deliver the decarbonisation of electricity by 2030. In the absence of EU-wide implementation, the CCAC has recommended a coalition of countries in north-western Europe should introduce a carbon price floor and indicate that by 2030 it will be €70 or €80 per tonne, thereby guaranteeing to investors that they will make money. “The issue of whether we should do it unilaterally is a separate issue,” FitzGerald says. “I think that Europe has failed, not through the unwillingness of the European Commission, but the objections particularly from Poland, and to some extent from Germany, to a rational policy in this area. This is important because part of the strategy of decarbonising Ireland is the electrification of heat and transport. Therefore, from a holistic perspective, the failure to decarbonise electricity will lock Ireland into a carbon intensive future. “The Danish Climate Change Council and various others forecast that the EU ETS is unlikely to deliver a price that will in turn deliver the outcome that we need. That’s a problem. We have recommended that Ireland joins with France, the UK, Scandinavia and the Netherlands in introducing a carbon price floor, if not across the EU, then in a regional coalition within the EU,” he clarifies. While the CCAC has expressed concern about the potentially adverse impact that the cessation of peat extraction and burning could have on the local economy, it regards the elimination of environmental harm as imperative. “The planned support for biomass co-fired with peat to continue in operation is madness,” FitzGerald affirms, before adding: “Last year, it cost a subsidy of €100,000 per person employed in that industry to keep it going. People were paid €50,000 on average so where did the remaining €50,000 go? It went on 2.5 million tonnes of extra carbon dioxide emissions. Reiterating the significance of robust carbon pricing, FitzGerald emphasises the nature of such a measure as a starting point. “There is a whole suite of other policies that we are going to need in the cases of agriculture, transport and heat, if we are to achieve the targets that we have set ourselves,” he concludes.